We have teamed up with a great organisation called Adventure and Science for Conservation. They are scientific networking group that put adventurers and scientists in contact with each other. Adventurers then carry out important scientific research in remote areas of the world to help the scientists. For us it give an opportunity to conserve the beautiful environment that we will be exploring. During or expedition we will be collecting Diatoms which are a type of algea that are found in all freshwater environments. The ones we are interested in are the ones that make boulders slippery in rivers. We will scrape a small amount of algae off rocks in the river and then post them to the University of Colorado to be analysed. What does the University of Colorado do? They are gathering samples from all over the world to create a massive database of Diatoms. They are identifying new species and gaining a more information about existing species so diatoms can be used globally as a water quality indicator. Many government agencies use diatoms to monitor the condition of freshewater steams and lakes as they are very sensitive to human impacts. Appart from in Europe, the knowledge of diatoms is very out of date or non existant in most areas so currently Americans use the Euopean specias as a guide to American water. Create a database of diatoms from all over the world. Identify what rivers are heavily poluted so measures can be put in place to improve the water quality. Uncover how human impacts on the environment effect freshwater ecosystems. Preserve diatoms which produce 40% of the worlds oxygen and absorb CO2 thus minimising the effect of global warming. 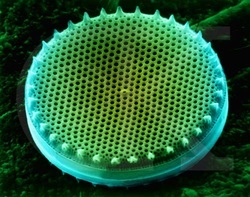 Single celled Diatom, characterised by a silica cell wall. Found in all freshwater environments, they form the base of many aquatic food webs. We feel that it is very important to give something back to the environment that we are impacting upon during our expedition. The amazing places that we will visit contain hundreds of thousands of different species of animal and plant. Humans cause massive interferences to the fragile ecosystems so we feel by carrying out this small bit of research we will be doing our bit to preserve these awesome places. Please take your time to have a look at what the University of Colorado are doing and also remember about the Adventure and Science for conservation website when you are planning your next trip! Diatoms come in all shapes and sizes and live in different water qualities so you can measure the water's quality by finding which diatoms are present. 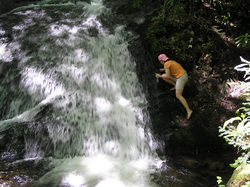 Collecting a diatom sample from a waterfall in the Smoky Mountains, USA. 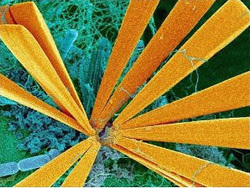 Diatoms can also be used to calculate past climate which can be used now to predict the effects of climate change.